8.30pm, Saturday, March 27, 2010 has been earmarked as Earth Hour 2010. Millions of people from thousands of cities are expected to switch off their lights for one hour as a symbol of support for the planet which is experiencing stress from climate change issues. 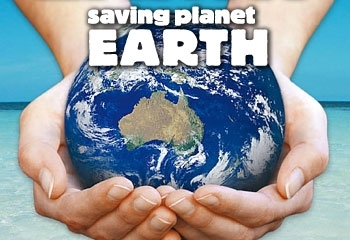 What was started in Sydney, Australia, in 2007 has now been adopted by millions of people around the planet as an initiative to create awareness on the risks of climate change and encouraging more people to do anything within their power to make a difference. Would switching off lights for an hour be adequate to save the planet? Although climate change issues have been debated at many forums at the global, regional and national levels, they are still being considered as "problems of the future" by many of us. Some may have even taken the stand that we may not live long enough to suffer the consequences. Worse, if such thinking is held by people with power and influence who have the capacity to decide on matters which are related to climate change problems. Let us consider whether it is really true that we are yet to experience the consequences of overlooking matters that relate to sustainability of our planet? Malaysia is located close to the equator where water supply should be abundant with the kind of rainfall that we are blessed with. Yet, some of us may be living in areas where water supply has been disrupted due to drought. Blame this on the effect of El Nino. Or could this be the consequences of not having adequate long-term and contingency plans for such a situation? As water is cheap here, most of the population have no problem in wasting treated water. In fact, we are demanding for the cheap water regime to continue so that there would be no need for us to change our lifestyles. We have to remember that the population of this country is growing and more people would be demanding for quality treated water in the future. On the other side, the sources of raw water remain the same if not depleting due to development projects and logging activities upstream. With such a scenario, would it not be better for us to make the change now while things are still very much in our favour? Some even see the water problems as presenting opportunities, economically! Just imagine if you could secure the contracts to change old pipes or be the supplier of pipes to various water projects. Without robust governance and oversight, the risk of unnecessary price inflation is very real. When such things happen, the cost would ultimately be paid by you and me, the poor consumers. Some global companies have demonstrated their seriousness regarding issues relating to climate change and sustainability. Unilever and Nestle had dropped the supply of palm oil from a supplier in Indonesia. This is due to concerns regarding the effect of plantation practices of the supplier on the environment. As we are heavily involved in palm oil production, we should be concerned that our palm oil companies are not subjected to similar risk. More importantly, we should have similar interest in ensuring our planters ensure sustainable practices so that our ecosystem remains viable for living as well as economic activities. Subsidies that we enjoy as Malaysians have shielded us from paying the real cost of many things. The electricity that we consume, for example, is largely generated from gas-powered generators. The gas supplied to our power generation companies is subsidised. The end-result is we are not challenged enough to change the ways we consume electricity, at the private level or by even by the industrialists. Thus, the stress on the government budget will grow while our competitiveness eroded as the need for our companies to be energy efficient is not there due to the subsidised electricity that they enjoy. Some of the issues are inter-related. Excessive logging enabled by corruption could reduce sources of raw water which would eventually affect the availability and quality of treated water supplied to our homes. While we may not be able to influence all matters, our collective voice in demanding more sustainability practices in our society and our collective action in walking our talk will shape the future of our children and grandchildren. Whether you and I will be switching off lights this Saturday will be based on our individual choice. It is not even critical, as the exercise is largely symbolic. The more important question is how much more could we, individually, do to make a difference in saving our planet?